about the storm, featuring photos submitted by readers. As the snow blanketed the region, many locals wondered how the severe weather would impact their daily routines. 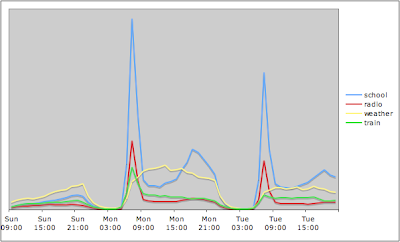 As you can see from Google Insights for Search, searches for schools spiked on Sunday and Monday. People also sought transit information, searching for train, bus, and airport information, as well as radio broadcasts. Interest in weather spiked when the storm began but remains high as people wonder what else is in store. This week, the U.K. is experiencing what is considered to be its worst winter storm since the early '90s. To keep track of the historic snowfall, there are several great My Maps. You can view photographs and see how much accumulation there is in different areas. Here's another useful My Map about the storm, featuring photos submitted by readers.